Soon after starting the Coffee Spot, my faithful Gaggia espresso machine gave up the ghost and I was on the market for the replacement. The Rancilio Silvia, by overwhelming consensus, was by far the best single-boiler home espresso machine for under £400, so four years ago, I became a proud Silvia owner. Fast-forward a year and Sage launched its dual boiler home espresso machine, instantly becoming a market-leader. However, it was well beyond my price-range (£1,200) and, well, I had my Silvia. A year later, Sage extended the range, introducing two single-boiler machines, the entry-level Duo-Temp Pro (£380), and the Barista Express (£600), with a built-in grinder. Again, I was impressed. I only managed to play with them at various coffee festivals, but even I managed to pull decent shots on them. I also heard nothing but good things from friends who owned them, so I began recommending Sage if people asked about home espresso machines. Despite this, I didn’t actually own one, largely because Silvia still had plenty of life left in her and represented a significant investment. Then, shortly before Christmas, Sage asked if I’d like a Barista Express. Well, I wasn’t going to say no, was I? Just so we’re clear on this up-front, my Sage Barista Express was an unsolicited gift from Sage, with no strings attached. That is, I entered into no agreements with Sage (or anyone else) as a condition of receiving the Barista Express. What follows is my honest opinion of Barista Express after three months of ownership and fairly constant use (barring the month I was in America). The Sage Barista Express is a single-boiler espresso machine with PID control. The initials stand for Proportional, Integral, Derivative, by the way. Informative? No, not really. What you actually need to know is that the PID controls the temperature of the water delivered by the espresso machine’s boiler. The PID is a fairly recent invention in espresso machine technology; the first one is generally considered to have been fitted to a Rancilio Silvia in 2001. This is ironic since my Silvia doesn’t have one (PIDs aren’t standard on the Silvia) and this is one of the main differences between the Silvia and the Sage range (which are all PID controlled). Whereas I’ve found the temperature stability in the Barista Express to be excellent, with the Silvia, there’s a large temperature swing (I estimate it to be at least 20⁰C), which plays a significant role in making espresso, which we’ll come onto later. However, first impressions can be misleading. As I started to explore the Barista Express, I grew to like it. It’s well put together, with lots of clever features. For example, the drip tray slides in and out far easier than Silvia’s does, making emptying and cleaning much easier. There’s also an indicator which shows when it’s about to overflow as well as a handy storage compartment behind the drip tray which is easy to get to. The removable water reservoir, with its in-built filter, is also easier to use than the equivalent in the Silvia. Then there’s the tamper, which neatly fits into a slot next to the grinder, although I was disappointed to discover that the Duo-Temp Pro and Barista Express have 54mm portafilters, whereas the Silvia (and the Sage twin-boiler machines) uses a 58mm portafilter, which means I’ve had to retire my lovely wood-handled tamper. That aside, I’ve grown to really like my Barista Express. It’s well-designed and well-constructed, a really lovely piece of kit. Of course, all of that is largely irrelevant compared to the main question: can it make decent espresso? You’ll find the answer to that question after the gallery. Before I describe the Barista Express in action, it’s worth reminding you of what I’m comparing it to: my Rancilio Silvia. My general routine with the Silvia was as follows. To ensure that the machine was fully heated, I’d turn it on about 30 minutes before I wanted to make an espresso. Then, because the Silvia doesn’t have PID, I’d go through an elaborate ritual known as temperature surfing. This involves running the pump until the boiler light comes on, indicating that the boiler was heating the water. I’d then wait until the light went off. At this point, the water was too hot, so I’d run the pump again, which would send a cloud of steam out through the group head. As soon as this dissipated (usually five-ten seconds), I’d shut the pump off, attach the portafilter (I usually ground the coffee while waiting for the boiler light to go off) and then pull the shot. At this point, I have a confession to make. I had largely stopped making espresso at home before the Barista Express came along. I found that I was pulling really inconsistent shots, frequently producing undrinkable espresso, with maybe one out of three or four shots being what I’d describe as acceptable. If I pulled a poor shot, I’d have to go through the whole temperature surfing rigmarole again before I could have another go at producing something decent. I should also point out, in Silvia’s defence, that some of my problems were down to the grinder, which wasn’t producing a consistent grind. So it’s against this background that I started to experiment with my new Barista Express. I’ll be honest: the first few shots were pretty awful. But then I got the grind right and suddenly I was making decent espresso. Shot after shot. Not all of them were great, but all of them were drinkable and some have been awesome. My routine with the Barista Express is as follows. I turn it on. After about 40 seconds, it finishes its warm-up routine and is now ready to use. I run some water through the portafilter to warm it up, grind my coffee, tamp it, attach the portafilter to the group head and press the go button. And that’s about it. If I pull a terrible shot, I adjust the grind size using the thumb-wheel at the side, and repeat the process. It really is that simple. To start with, I weigh the precise dose of beans (usually 19g), then put them in the empty hopper. I’ve set the grinder to deliver about 16g, at which point the portafilter is almost overflowing. I then flatten out the coffee and manually run the grinder until it’s empty. Then I tamp. So far, the grinder’s been a joy, producing a consistent, even grind (far better than my old grinder). When it comes to pulling the shot, again I do it manually, using my Bonavita scales, which I also use to time the shot. I’m looking for an output of about 38g with an extraction time of 25-30 seconds, although my shots often run quicker than that. The Barista Express has a pressure gauge, by the way, which I find fascinating. I love watching the pressure quickly ramp up through the extraction and it can be a useful measure of whether you have ground too coarse (pressure is low) or too fine (pressure is high). On the other hand, since I weigh/time the shots, I notice these things anyway. However, if you use the automatic settings, it’s a useful indicator of things going right/wrong. Plus, over time, I’ve found that I rely on it more and more. My verdict? The Barista Express (and its grinder) lets me pull consistent shots with the minimum of fuss. The ultimate test: it’s got me making espresso at home again. Can Sage have it back? Over my dead body! However, there’s one more aspect of any home espresso machine: steaming milk. You can see how the Barista Express shapes up in that department after the gallery. Again, I have to start with a comparison to the Silvia. Generally speaking, the Silvia was quite good at steaming milk. First, having pulled your shot, you switch the boiler over to steam. I never timed it, but it always felt like I was waiting around for the boiler to get up to temperature. You have quite a bit of control on the Silvia, turning a knob to determine how much steam the wand delivered. I certainly managed to steam some decent milk in my time, but again, it was very hit and miss. Partly I think that was down to my poor technique: I’d often put far too much steam through the milk, or I wouldn’t put enough through. In the end, long before I gave up making espresso, I gave up making milky drinks. There was also a problem making multiple drinks. The Silvia took a long time to switch back from steam to espresso, so you really had to pull all your shots first, then steam the milk. In contrast, the Barista Express gives you far less control. There’s a rotary switch on the side: turn it to the left and you put the Barista Express into steam mode. A light flashes and when it stops, the wand starts producing steam. At this point, turn the switch back to “off”, put the wand into the milk jug and turn the switch to steam again. Within seconds, it starts steaming your milk, although it does seem to take a long time (compared to the Silvia) to steam a 150ml jug of cold milk. However, with practice, I can produce a good, dense micro foam. At first sight, this control system seems a lot clunkier than the Silvia, but I actually really like it. I’m not very good at steaming milk, not least because I don’t do it very often (maybe twice a week), so taking one variable (the amount of steam) out of the equation really helps. I find my steaming is much more consistent with the Barista Express and, as with espresso, it’s got me drinking flat whites at home again, which is the ultimate endorsement. I still can’t do latte art though! So to the final question, would I recommend a Barista Express? Well, that depends. If you are starting from scratch and have £600 to spare, then get a Barista Express. It really is the best value machine out there and a cracking piece of kit. 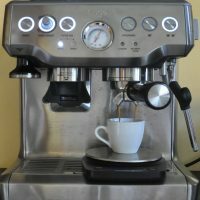 If you are looking for a replacement machine and already have a (decent) grinder, then take a look at the Duo-Temp Pro. Although I can’t speak from direct experience, I believe it’s the same basic single-boiler machine as the Barista Express, so should produce the same consistency of espresso and milk. It lacks the bells and whistles of the Barista Express, so no automatic dosing, programmable shot lengths or pressure gauge. On the other hand, if you’re like me and do it all manually anyway, you’re not going to miss them. If I’d been looking for a straight replacement for the Silvia, I’d have gone for a Duo-Temp Pro. If you are starting from scratch and can’t quite stretch to £600, you could always get a Duo-Temp Pro and a separate grinder, which you could probably do for around £500. Finally, if money is no object, the £1,200 Dual Boiler is worth a look or its even fancier stable-mate, the £1,700 Oracle. December 2017: Sage Barista Express was a runner-up for the 2017 Most Popular Coffee Spot Award. April 2019: I had a chance to try out the new Sage Barista Pro at the London Coffee Festival. This entry was posted in Coffee Kit by Brian Williams. Bookmark the permalink. What a well-written and detailed review — and it’s particularly useful to have the comparisons with the Silvia. Glad to know that the Barista Express lived up to your expectations! Possibly a stupid question but are your 38g shots are singles? Thank you for the excellent review from the perspective of use over several months. This is very useful especially to those of us that are yet to buy an espresso machine, even more so when you are comparing it to another machine that you have extensively used. This seems to suggest that you are making what would be regarded as a ristretto rather than a traditional espresso. What would be good from my perspective is, could you also try the default automatic programme mode for making an espresso and give your views on that also, especially as I suspect that most buyers of the Barista Express would start using it in this mode and possibly only this mode. PS – I was writing the above just as you answered Bex’s reply. Glad you liked the review and found it useful. As I said in my reply to Bex, I think names are rather pointless. Personally, I think a ratio of 2:1 (38g in, 19g out) is an espresso, although 3:1 might be a more traditional Italian espresso, whereas I’d describe a ristretto as a ratio of 1.5:1. At the end of the day, names don’t matter. As long as you are making coffee you like, who cares what it’s called? And as long as you’re making coffee you like, you’re doing it right, regardless of the ratios that you use. I’m not sure you’d get anything out of me using the automatic settings. I pull espresso shots that I like. Ultimately, it all comes down to taste. I could tell you it pulls shots long, for example, and that I don’t like them, but what does that mean to you? As I’ve been looking more & more into espresso machines and using them, especially after my visit to this year’s London Coffee Festival the past weekend, I understand where you are coming from. As you say, the most important aspect is that you enjoy the coffee that you make, irrespective of what others like. Excellent review – purchased mine today and after 3 goes made a really good flatwhite for my wife, which she loved, thats justified the spend already, hopefully i’ll get a ROI just from her not buying coffee from costa. I loved the coffee , I had aa excellent cusineart grinder and cofffee pot, which i have had for 10years, but always looked at buying one of these machines. Great review. I bought a Duo Temp Pro last week and was a worried that I would be drinking bad coffees for weeks until I’d sussed it. Fortunately, within two days I had replicated my favourite flat whites and achieved consistently pretty quickly. This is a really good machine. Thanks Darren! It really is a wonderful machine. Hi Brian thanks for the post. Your review was one of the main reasons I purchased this particular machine and am enjoying testing it out. Just for my own reference, what grind settings are you using (grind number and timer position). I’m using Square Mile’s Red Brick and understand all beans produce different results but would be interested to know your settings. It’s not just different beans that have different settings, but it also depends on the temperature, humdity, age of the bean, etc. There’s no point my telling you what my setting is since I’m constanty changing it, often by our or five notches on the dial. If you are seeking consistency, my advice would be to get a set of scales and ensure you grind a consistent dose each time. I go with a 17g dose, which leads to a very full portfilter. Hi! Good post. I actually own the BE and have recently also just bought the Silvia with Rocky Grinder in order to evaluate them both and return the one I like least. The BE was my first step-up from the Delonghi Icona, and when I got it, I thought it was good, mainly for the built in grinder. But the milk steaming is, for me anyway, terrible. Too slow and takes way too long to get anything useful from it. In comparison, the Silvia is a steam machine, the power from the single boiler is quite impressive. I don’t even mind performing the boiler refill/flushing/waiting, it’s worth it. And the quality of the machine it self is far better than the BE. Not knocking the BE at all, it is a great package, and for the money it beats everything else. Sure, I might be giving up a few internal parts for the Silvia, but it’s just too good! Still on the fence with this one. I always find it fascinating when different people have different takes on things. I agree that the Silvia has a powerful steam boiler, but I much prefer the Sage because I never could control the Silvia: I’d either burn the milk or get too much air in it. I suspect that it’s largely down to the lack of skill of the operator (ie me) but I always found that the Barista Express gave much more consistent results. Do let me know what decision you reach in the end. Hi Brian, many thanks for the informative review. Can I please ask about your coffee to milk ratio when making flat whites from the BE? If pulling approx. 38ml espressos from 19g of coffee are you going 2:1 on the milk i.e. approx 80ml milk or more? Also I’ve ready many conflicting things about flat whites having steamed milk with micro-foam milk on top and others just saying it should just be micro foam milk or indeed just steamed milk. What’s your personal take on what constitutes the most ‘authentic’ flat white? I try to aim for a two-to-one ratio of milk to espresso, but it’s very hit and miss to be honest. For me, a classic (I’ve no idea what is or isn’t authentic) flat white is a consistent, densely-steamed micro-foam. I suspect, however, that if you ask 10 different people, you will get at least 10 different answers. My personal take on all this is that as long as you’re enjoying the coffee, you’re doing it right, although it never hurts to experiment!